Home » Employment » Shareholders of Foreign Corporations Liable for Wages? 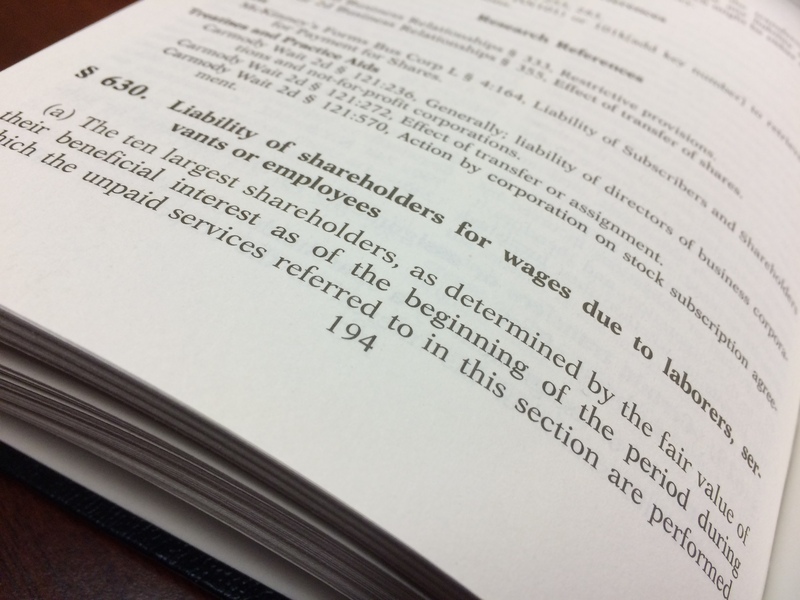 Shareholders of Foreign Corporations Liable for Wages? Last year, I wrote a post about amendments to the Wage Theft Prevention Act that added a provision to the New York Limited Liability Company Law, imposing personal liability on the members of a limited liability company with the ten largest ownership interests for the failure of the company to pay the wages of its employees. These amendments were similar to provisions already contained in Section 630 of the New York Business Corporation Law, which imposes personal liability on the ten largest shareholders of a corporation (other than a publicly-traded corporation) for the unpaid wages of employees of the corporation. On November 20, 2015, the Governor signed an amendment to Section 630 [Chapter 421 of the Laws of 2015], which extends the reach of this provision to foreign corporations, when the unpaid services were performed within New York. Although the law has been criticized because “it might turn business away from New York,” I do not necessarily see it this way. That’s because shareholder liability is not automatic. Before an employee can charge a shareholder for such unpaid wages, the employee must first provide a notice in writing to the shareholder, within 180 days after termination, advising the shareholder that he or she intends to hold the shareholder liable under this section. The employee cannot commence an action against the shareholder until after the return of an execution unsatisfied against the corporation upon a judgment recovered against it for such services. Once an execution is returned unsatisfied, the employee must then commence his or her action within ninety days. Therefore, as long as the company has sufficient assets to cover the amount of any unpaid wages, the shareholders aren’t likely to be concerned about this possible liability. Also, depending on the amount owed, it may not be cost effective for the employee to hire an attorney to prosecute these two lawsuits–even with the prospect of attorney’s fees and liquidated damages that are both recoverable under Article 6 of the Labor Law. But, a word of caution. Even though lawsuits under Section 630 are rare, I can think of at least one time in my nearly 20 years of practice that I was able to recover against shareholders for failure to pay wages of a former employee. It should be noted that this Legislature recently recognized the problem revealed during the recent economic collapse in which unscrupulous businesses opened and closed without paying wages due their employees. The Legislature increased the penalty for failure to pay wages to 100% of the wages owed. However, the penalty is meaningless if the employee lacks an effective remedy for recovering his or her unpaid wages. The amendment strengthens existing remedies. The amendment will be effective on January 19, 2016. By Pete Weishaar in Employment, Labor on December 2, 2015 .